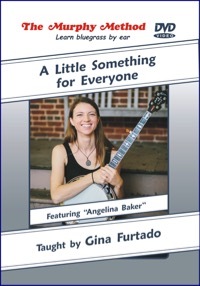 Gina Furtado: A Little Something For Everyone - Gina Furtado, heralded banjo player for Chris Jones and the Night Drivers and finalist for IBMA Banjo Player of the Year in 2018, teaches five tunes in the easy-to-learn Murphy Method style. Her explanations are clear and her brilliant tone shines through on every note. Intermediate and advanced players will push their playing forward after encountering Gina’s inventive approach to melody. Gina is a powerful young player who first learned to play banjo from Murphy Method creator, Murphy Henry. As always, every tune is taught note by note. No Tab. The first three lessons are well-known fiddle tunes; "Edelweiss" is, of course, from The Sound Of Music; and "Last Frost" is one of Gina's originals.